Giving a raw view of all things that drive me insane since 2003. 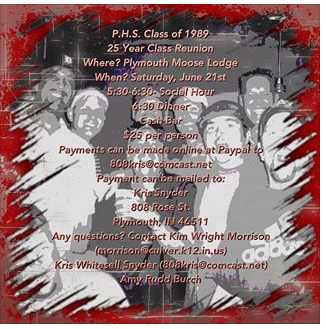 Nothing says small town like having your 25th class reunion at the Moose Lodge. I had missed both my 10th and 20th for different reasons (birth of child, wedding anniversary), but it is hard to get up from 1000 miles of travel each way for a dinner with at the Moose. I can only hope that a family reunion is that weekend to make it even worthwhile to travel.